How Efficient Is Your Furnace Today? 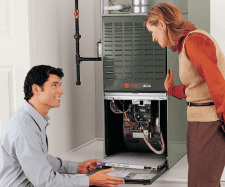 Like any appliance, a furnace can to lose efficiency over time. The older your heating system is, the more wear and tear it has endured, which causes the overall efficiency to decrease. The general rule of thumb, as determined by experts, is that a furnace will lose approximately 1% of it’s efficiency every year. Unfortunately, it is often unavoidable, even with proper maintenance and care. This would mean that your 15 year old, 80% furnace is now somewhere closer to 65% efficient. What seems like an unimportant chore, changing or cleaning your furnace filter regularly is the first and best thing you can do to expand the lifespan of your system. Prepare your heating system for colder weather BEFORE the frigid temperatures arrive. Our expert service technicians will be able to ensure that your system is running properly and as efficient as possible for the heating season. If you've done the math and aren't satisfied with the current efficiency of your system, it might be time to take a look at replacement options. Take advantage of current furnace promotions, utility rebates and tax credits that are available for a limited time! Contact us for maintenance, repair or replacement today!